I’ve been hanging onto these reviews for a while now, for no reason, really. I will say that I’ve been getting into the habit of reading books and watching movies they were based on, so I might actually start doing those, too, from time to time. I won’t with A Monster Calls and I haven’t seen anything of Strike in a while, but I have a few other book-movie-tie-ins in the works! Anyway, A Monster Calls was a book I’ve wanted to pick up and read ever since I saw the movie and bawled my eyes out. Even as I knew how things would end, this book still made me feel all emotional. And it was so wonderful. Every annoyance I had with Lethal White had to do with the drama around Robin and Matthew. I’m not sure why the first entire part was on Robin’s wedding, and the quicker that shmat was over, the better. Unfortunately, I wasn’t as enthusiastic about the politics and mystery of this book as I had been with some of the previous books. Still, I’d watch the show when I can. Then again, maybe not. But at least she’s trying and that’s what counts, right? Anyway, I slipped on my March reading a bit, but I did get a few things in before I started my nightly TV binges. I might as well tear off the bandaid now and get the books I didn’t like over with. That being said, I highly recommend the movie for its dark and comedic nature. Like, seriously, I didn’t think I’d be entertained by a mom vlog until Anna Kendrick’s Stephanie made it fun. Though honestly my main takeaway from the movie–and the entire story itself–was how to make a perfect gin martini. The next book was something my friend and I discussed as an option to read for our podcast, Fableulous Retellings (which, I know, I know, one of the things I need to get back to updating at some point, along with my life), and at the time I was really committed to reading something that was an Orpheus and Eurydice tie-in. I mean, honestly, you don’t get too many of those retellings, right? Lord almighty, help my soul. I swear I’m not trying to hate on magical realism, but it’s really hard to find a good one that doesn’t make me cringe like most of magical realism books. I mean, come on, I do enjoy Gaiman at least. He’s magical realism, right? As is Patrick Ness for the most part, right? I was actually very entertained by this book, and it was a quick read. I was on the fence with Sage as the main character, but the reveal that had my super suspicious from the beginning kind of explains his unbending personality and it suits him. I will have to pick up the rest of the books to know what happens next! In a discontent kingdom, civil war is brewing. To unify the divided people, Conner, a nobleman of the court, devises a cunning plan to find an impersonator of the king’s long-lost son and install him as a puppet prince. Four orphans are recruited to compete for the role, including a defiant boy named Sage. Sage knows that Conner’s motives are more than questionable, yet his life balances on a sword’s point—he must be chosen to play the prince or he will certainly be killed. But Sage’s rivals have their own agendas as well. I saw this trilogy sitting in my classroom last year and a half, and one of my voldies from last year had recommended it as something good to read. I finally decided to have a listen (because yay to Libby for having a copy of the first book as an audiobook! ), and I honestly was quite entertained by the perspective. We follow Sage, a sassy orphan boy who gets taken in with other orphan boys in some crazy plot to pose as the missing prince Jaron. While Sage is only one of four who fit the bill, there’s still some work to get done, and Conner–the man orchestrating this deception–has a deeper agenda of his own. Something doesn’t sit right with Sage, and he’s bound to find out what it is sooner or later. Honestly, as entertaining as Sage’s perspective is, he does come across as a cocky little smartass sometimes, and occasionally I did want to smack him in the face. One of my big problems with him is his random and sudden attachment to the “pretty servant girl” that shows up in the middle of the book. I don’t buy it, and it bothered me, considering I really didn’t care much for Imogen (I’m also not fond of the “guy falls for pathetic and slightly helpless girl and tries to protect her” as a plot point. I hated it in The Night Angel trilogy, and I absolutely loved that series, so…). In any case, it was an easy enough read, the pacing of the story was fast-paced, and I could have easily listened to it nonstop without a problem. I’m kind of amused at how things turn up at the end, and it does look like there’ll be more to the story now that we know what’s actually happened to the royal family. Also, I love Mott. More Mott, please! 4 out of 5 cookies! Urgh, my library needs to get the rest of the Ascendance trilogy on audiobook so I can continue listening to this. Alright, I’ve been sitting on these mini reviews for a while now, and these were some really good ones! February was a pretty busy reading month, and some books I definitely enjoyed! I’ve read A Wrinkle in Time several times and I adore the book. I’ve been using it as a study-book novel for my 6th grade voldies, and I realized I hadn’t read the graphic novel! I love this version, too. Becoming had been on my holds list on Libby for weeks on end. I finally had the chance to listen to it last month, and it was great! This must have been the longest time it took for me to read a Schwab book from cover to cover, but hot damn it was good to get back into Merit. Side and new main characters aside, it was still largely an Eli vs. Victor book and their confrontations are the absolute best. Also OMGAH CAN I GET A THIRD BOOK PLEASE? They were best friends, and rivals, and then enemies. They were dead, then alive, and then—Eli killed Victor, once and for all. Or so he thought—but Sydney Clarke felt otherwise, and used her own superpower to tip the scales. Now, a trio hides in the shadows, while another takes advantages of post-death life to take over the city of Merit. 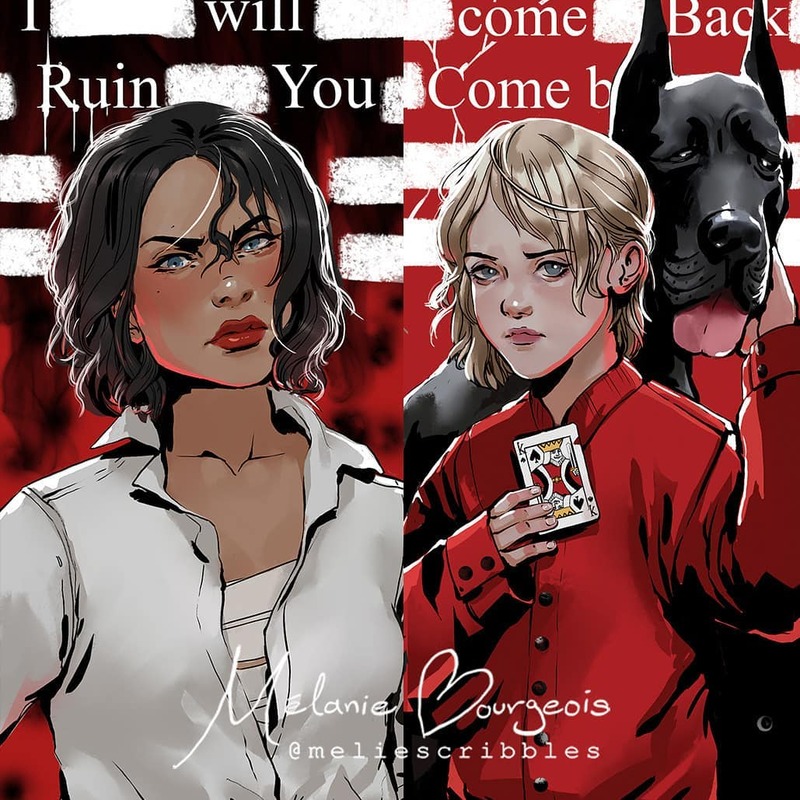 Remember when I reviewed Vicious and couldn’t wait to tote this book off because YES, it’s finally a standalone and YES OKAY, I could do with a sequel if there was one? Okay, neither do I. That was so two years ago, and all I remember is that between Eli and Victor, Eli was most definitely the more unhinged villain. Well, he kind of gets one-upped in Vengeful because I mean, honestly, HOW Schwab made me feel some sort of sympathy for Eli Ever is beyond me. Like…thanks a lot, Schwab, now my feelings for your psycho characters are in turmoil, and AGAIN, we have a Holland-type character on the loose. Figuratively speaking. The book then proceeds to recount snippets of the past, going back five years ago to the aftermath of the Eli-Victor fight. We find out many things, including the fact that Victor is broken somehow, and is pretty much following in the lines of the one guy he’d managed to outwit. Meanwhile, we have Eli hanging out at EO-jail and, well, you know, helping out the “good guys,” so to speak. Except, ya know, are there even ANY good guys in Merit or the known Villains world? No? Never mind. Aww, but they cut such a striking set! Who needs good guys when you have villains anyway, amiright? Like its predecessor, Vengeful is not action-packed. There is a lot of buildup to the action, and frankly, it’s probably why it took me a good month to finish. Not because it was uninteresting. Not because it didn’t have really good writing–and believe you me, I will buy anything Schwab writes, even an informational pamphlet on the science of duck migration or something (which, come to think of it, I’m sure she’ll make that interesting, too!). It was just, well, a lot of information to take in. Along with the characters in Vicious (Victor, Eli, Mitch, Sydney), there were new characters added into the mix. This kind of gave a more epic showdown, because so many parts had to be brought together to make the whole. So I got the book from an Owlcrate exclusive last October, and the swag that came with included some really choice artwork of the books. It’s fabulous, really. That being said, it was also where things were kind of off for me. Because of the several POV changes and so many character perspectives, I couldn’t get into some of them. June, for example, wasn’t my cup of tea, and honestly, I could do without hearing about her in the next book–if there ever is going to be one. I did love the addition of Dom, though, and Marcella was great, but yeah, other characters made it a slow-go for me. I do think the book also suffered a bit from two storylines that got mixed in together, and honestly, the buildup to the whole Marcella deal was so massive that the end was just…well, again, anticlimactic. That being said, I’d still read the next book anyway, because I want more. I don’t believe it’s the end for the cosmic-circling duo, and honestly, I just want someone to fix Victor. FIX HIM, SYD. Also, Mitch is still the absolute best. 4.5 out of 5 cookies! I pretty much rated Vicious in a similar fashion…but the first book was definitely my favorite of the two.